A lot of great stuff found new homes today at our big Barn Sale. And that's great, but we also reconnected with old friends, met new friends with uncanny ties, and made strangers part of the community. That, my friends, is what this farm is all about. Laurie, Kris and Dina visit in the shade. Christie, an amazing mother of 10, came back to the farm to buy supplies and show off a wheel that was given to her at an estate sale. It looked pretty good with just a couple of tweaks needed. Christie had bought another old wheel from me a year or two ago, and is still very excited about fiber. We met Anela, whose Hawaiian name might have tipped me off that we'd have some common history. Turns out that her mom and I graduated from the same high school in Wahiawa, Hawaii, three years apart, back in the 70's. Can you believe that? What are the odds? Anela teaches hula dancing, if you are in the market for a class, FYI. Mary helps gather eggs, while touring the farm. Our friend Mary from Valley Ranch drove out to take advantage of the sale, and to visit the lambs for the first time. 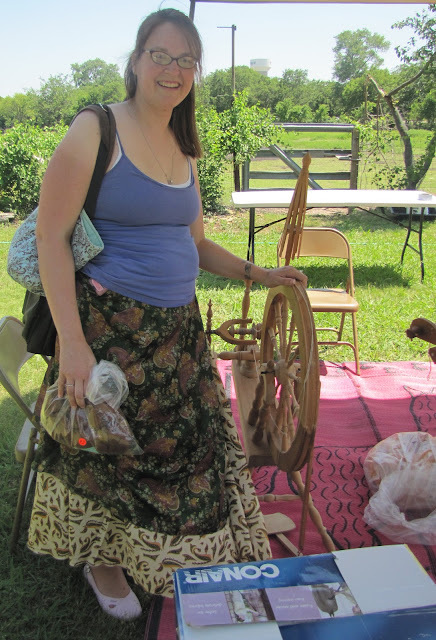 Mary only gets by the farm for big festivals, usually, but today she got a lesson and left as a new spindle spinner. I'm hoping she'll get to come out more often to spin with us in the LRB. 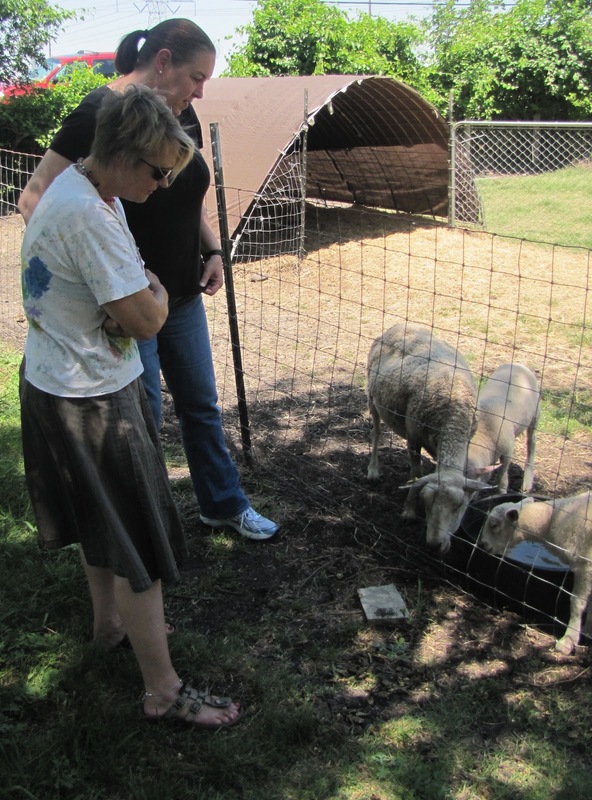 Laurie and Mary get to visit the lambs for the first time. Right at the end of the day, we met a trio of lovely Irish gals, two of whom won spinning wheels in the silent auction. They live close, so I hope we'll be seeing them again for our third or fourth Saturday spin-ins at the LRB. Fiber just brings the greatest people together! Shannon scuffled in a last minute bidding war, to win the Finnish spinning wheel. Putting the sale together really wiped me out - thank the good Lord I had so much help from my pals Gail and GrandmaTutu. Today's angel, by far, was our pal Dina, who arrived early, made signs, toted and fetched, stayed late, and nearly cleaned up the place single handedly. 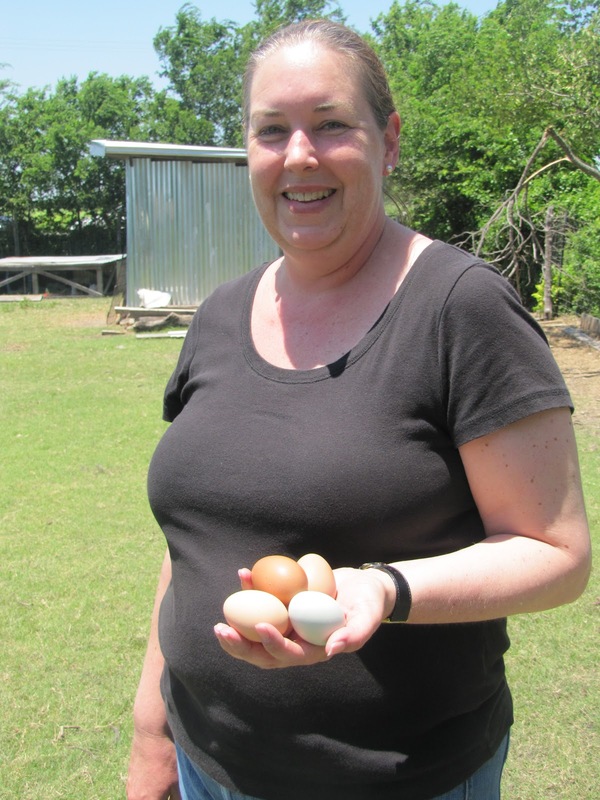 I could not do all this stuff without the sweet, sweet people who make up our farm community. You guys rock--thank you. Edee, Maryann and Michele enjoy some down time. Bon voyage, Michele! In spite of the heat, a very sweet circle of friends spent a good portion of the day working on knitting or crochet projects in the shade of our big mulberry tree. We got to enjoy a lot of relaxed conversation, and also spend some time with our friend Michele who is getting married soon, and will be moving far away. We hate to see her go, but are so happy for her new future. That's my idea of a great summer Saturday.